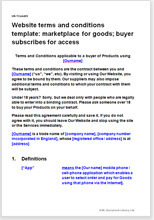 This template allows you to comply with the Sale of Goods Act. . The Competition and Consumer Act 2010, and other consumer protection legislation allowing your sellers to sell to businesses or consumers.